Only $32.00 Magnetic Hammer (16 Oz.) 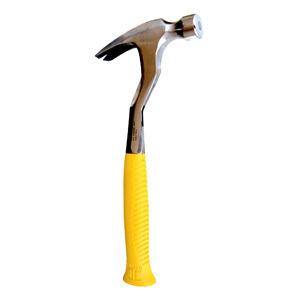 185256000261 EW0026 JC Hammer Inc.
mfr: JC Hammer Inc. 16 Oz HAMMER WITH MAGNETIC TIP. Magnetic Hammer for the installation of roof dry-in underlayments, house wrap, sheet metal and drywall. To be used with plastic cap nails, metal cap nails, roofing nails, and drywall nails. This all steel top of the line hammer features a heavy duty magnet, slip resistant handle and the angle shaft which reduces vibration and prevents hand injuries. 16 Oz HAMMER WITH MAGNETIC TIP.